Having collected positive reviews from all quarters, we rank among the top names in the industry. ICE Flaking Machine on offer is available in a wide array. Its processing is done making use of high tech equipment and latest technology. This offer is made irresistible by its features such as ice bin, auto cut off system, overflow, electrical safety system and replaceable connectors. Lay your hands on this wonderful quality at nominal rates. 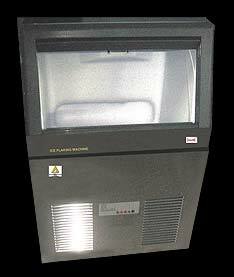 Ice Bin : Ice holding tank made of stainless steel insulated with PUF so that ice can be stored for longer period withoutmelting. Auto cut off system : Auto cut off in case of water supply failure and maximum ice level. Overflow – Drain Line : Overflow and drain lines are provided for continuous draining of water. Electrical Safety System : The MCB is provided in the main electrical line for all important components like compressor gear box driving motor etc. Replaceable connectors are used for wiring, approx electrical load 1 KVA, 220 volts, 50 cycles.